Please refer to the following guidelines before submitting items to the Music Kits category on AudioJungle. Also be sure you are familiar with our general music uploading instructions. Music Kits must be based on already approved Music items on AudioJungle. In other words, the music itself must have already passed initial quality approval before you can choose to package and sell it as a kit. You must provide a link to your existing approved Music item in the comments to the reviewer during upload. We also encourage you to cross-link your items in the item descriptions. Please note that even though the original Music item may have been previously approved on AudioJungle, this does not necessarily mean that the kit will automatically pass further quality review. Music Kits must include a full set of song section audio files to allow easy and extensible arrangement of the music. See the Technical Requirements below for more details on what song sections to create and include. Music Kits must include at least 1 pre-built demo arrangement track, that should utilize most / all of the primary song sections. You may optionally include up to 3 total pre-built demo tracks. All demo tracks must be included in the main item as ready to use exported WAV files. To fully showcase your Music Kit, it is recommended that every included song section be used at least once within the set of demo tracks. You may also optionally include project files of the demo track arrangements as a starting point for users, using more universal/accessible software such as Garageband or Adobe Audition. The item preview MP3 should be a watermarked version of the demo arrangement track(s). If you made multiple demo tracks (up to 3), you must include all of them within the item preview as well. The item description must contain a list of all included song sections in your Music Kit, along with their individual lengths. The above code will appear as follows, linking buyers to more information on our Help Center. If your music is registered with YouTube Content ID you must also follow our additional guidelines here. These technical requirements are intended to ensure a high level of consistency, clarity, and ease of use across all Music Kits. Please read them carefully. Once you get the hang of it, it’s just like riding a bike! Music Kits must have a single, consistent tempo throughout. Music Kits must have a single, consistent musical key throughout (no key changes, no modulations). All audio content within the Music Kit must be provided as 44.1 kHz 16-Bit stereo WAV files. MP3 files are not allowed (except as the watermarked preview file). Authors may generally decide how short or long to make the separate song sections for their own Music Kits. We typically recommend splitting into primary song sections (e.g. intros, verses, choruses, bridges, outros, endings, etc), however this may depend on what works best for your individual song. There is no specific requirement on the minimum or maximum number of sections you may include, however for a typical kit we recommend 10-20 for a good balance of flexibility and ease of use. Music Kits with overly short / separated sections throughout such as all individual instruments, notes, or chords will not be accepted. Keep in mind the goal is to make arranging and extending the song easy for users, not for them to have to recompose the music. As a rule of thumb, if a song section is 30+ seconds long, consider whether it might work better as two separate song sections, or make sure to include a shorter version of it in the kit as well. This will help users be able to easily achieve a more flexible length. Including variations of individual song sections such as alternate lengths, mixes, and/or instrumentation is okay. E.g. a version with no melody, a version with just drums & bass, an abridged or extended version, etc. This will again depend on what works best for you and your individual song. Providing additional alternate endings and shorter ending “hits” or “buttons” is strongly recommended. Clean and natural ending options are one of the best ways to help users achieve a more flexible and professional sounding result. Do not include seamless looping clips of your song sections. As it is, just about any song section of a Music Kit will already be naturally and seamlessly “loopable” by simply repeating that section. Also do not use “loop” in any of the song section file names to avoid any confusion here. Do not include individual instrument stems intended for further mixing/layering. Again the goal of Music Kits is flexibility and ease of use, not for users to remix or recompose the song. Music Kits must include 2 matching sets of song sections: one with tails (natural endings) and one without tails. When we say “tails”, we simply mean the natural time it takes for the audio to die out after the final note in the song section is played. The “tails” sections are used to provide seamless transitions in the final arrangement. The “no tails” sections are provided to help users quickly and easily snap together and arrange a temp / guide track for their project, especially if their editing software does not support tempo grids or beat snapping (many video editing tools do not). Once that’s ready, they can simply swap out / line up the “tails” sections with the matching “no tails” version, and the song is ready to go! 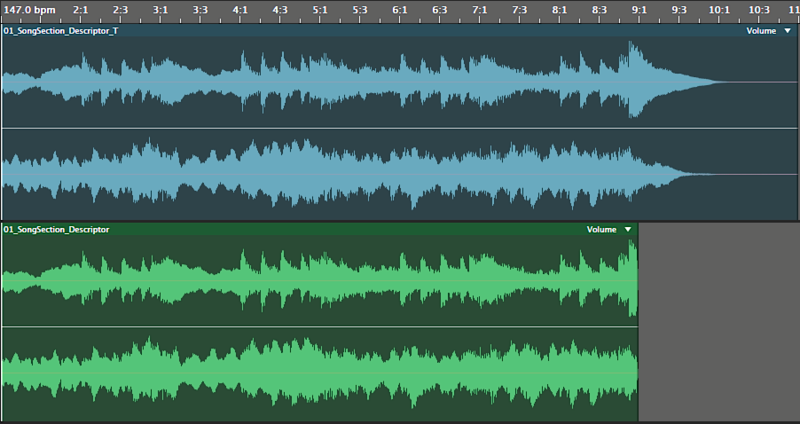 Each of the “tails” sections must be exported with the full, natural audio tail intact. Each of the “no tails” sections must be the same as the corresponding “tails” version, only cut off at the proper beat/timing (where the next song section would begin). Every “tails” section should have a corresponding trimmed “no tails” version, no exceptions. This includes any song sections that would normally be used as final endings / outros. All of the song sections must have clean, natural beginnings, without any overlap from previously played notes. As such, each song section must be bounced/exported individually from the original source material, not simply cut up from an existing fully exported track. Create and bounce all of the "tails" song sections from your original project file. Try out all the tails sections in various arrangements to ensure they work well together. If necessary, go back and adjust or create additional tails sections to help your kit be as seamless and flexible as possible. Once you're happy with the tails audio files, trim them all at the appropriate beat / measure and export each individually as the "no tails" audio files. This will ensure they match exactly and should save you time. Build your demo arrangement track(s) using your actual finished song sections. This will help you double check that everything is sounding good with your final kit. Because of these special requirements, there may ultimately be certain music that just doesn’t work well as a Music Kit. For instance songs with vocals & lyrics may be more challenging to produce in this modular format, as well as live instrument recordings. In these cases, it would simply be best to choose compositions of yours that naturally work well as a Music Kit. You may also choose to re-record parts or new material for an existing item if you wish, or simply produce some brand new music with the Music Kits requirements in mind. For “##” each file should have it’s own unique sequential number for easy identification. You should also order your files in a meaningful way (e.g. grouping related sections and variations). Do not include the song title in the individual song section file names. 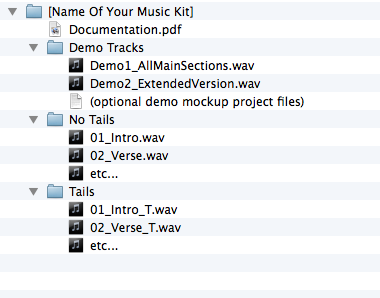 The song title will already be the name of the main Music Kit folder. A Music Kits documentation template is available for your use here. You may modify and personalize it as needed.